Global Water Heater Market size for 2017 was over USD 25 billion and the annual deployment is set to exceed 150 million units by 2024. Rapid urbanization coupled with growing demand for energy efficient heating systems will drive the global market size. Ongoing economic transformation across the developing economies owing to increasing spending toward the development of new and advanced technologies will stimulate the product adoption. In 2017, as per the UNCTAD, the world will cater over 70% of the global population in urban areas by 2050. Considerable investments toward infrastructure development coupled with rising demand for reliable, eco-friendly and cost-efficient heating systems will positively influence the market growth. In addition, accelerating demand for advanced solutions on account of improving living standards primarily across the emerging economies will complement the business outlook. Government initiatives toward the adoption of renewable systems with an aim to limit carbon emissions will accelerate the global market growth. Consumer awareness pertaining to operational benefits of advanced heating solutions over its existing counterparts will stimulate the business growth. For instance, Government of Canada under its “Greening Government is aiming to reduce the GHG emissions by 80% by 2050 when compared with the 2005 levels. Solar water heater market will grow on account of introduction of government incentives and subsidies toward the adoption of sustainable systems. Furthermore, frequent outages and demand-supply mismatch owing to extreme climatic conditions will stimulate the product adoption. For instance, in 2016, United Nation relaunched solar housing program that mandated the installation of solar water heaters in new buildings. Instant water heater market is anticipated to grow on account of efficient energy utilization coupled with rising demand for quick hot water supply. Fuel flexibility and limited maintenance requirements are some of the prominent features which will encourage the product adoption. Increasing deployment of these systems across residential & small-commercial establishment owing to its precision temperature control & improved environmental sustainability will favor the business scenario. Increasing adoption of heating systems primarily across the residential establishments owing to improvement in living standards will augment the below 30-liters water heater market. Changing consumer preference toward the adoption of sustainable systems coupled with improving quality standards will positively impact the business outlook. High application suitability for commercial establishments including healthcare, hotels, financial institutions and shopping complexes will stimulate the 30-100 liters water heater demand. Extreme climatic conditions coupled with growing consumer inclination toward energy efficient heating systems will boost the global market growth. Higher efficiency along with convenient and easy installation are some of the vital parameters stimulating the electric water heater market growth. Minimal standby loss along with limited maintenance requirements will fuel the product demand. For instance, electric water heaters reduce energy usage to around 40% with minimum energy wastage. Gas water heater market will grow on account of quick hot water supply along with limited operating cost. Secondary heat exchanger facility to pre-heat water and advanced features to control various functionalities including gas flow, ignition and temperature control will augment the product demand. Surging demand for water heating solutions across the residential establishments on account of rising per capita income will boost the water heater market growth. Increasing requisite for the replacement of conventional systems coupled with consumer awareness toward the adoption of energy efficient & sustainable solutions will fuel the industry growth. Commercial water heater market is anticipated to witness growth over 5% by 2024. Increasing spending toward the infrastructure development including hotels, healthcare, shopping complexes and office buildings will stimulate the product adoption. Increasing demand for energy efficient systems coupled with introduction of initiatives to reduce the environment concerns will boost the U.S. water heater market growth. Growing focus toward the tourism and hospitality industries coupled with ongoing replacement of conventional heating systems will complement the business outlook. In 2017, the sun shot initiative have invested USD 46.2 million to promote the adoption of solar energy across major heating applications. Stringent regulatory policies owing to carbon emissions along with strong emphasis on the adoption of fuel efficient technologies will stimulate the UK market growth. For instance, according to “Department of Energy & Climate Change”, the UK government anticipated that the annual net savings resulting from energy efficiency standards will exceed USD 1,100 million per year with reductions in GHG emissions by 7 million tons annually by 2020. Divergence toward clean and renewable energy usage coupled with technological advancement to achieve limited cost of energy are some of the vital parameters which will fuel the China water heater market growth. 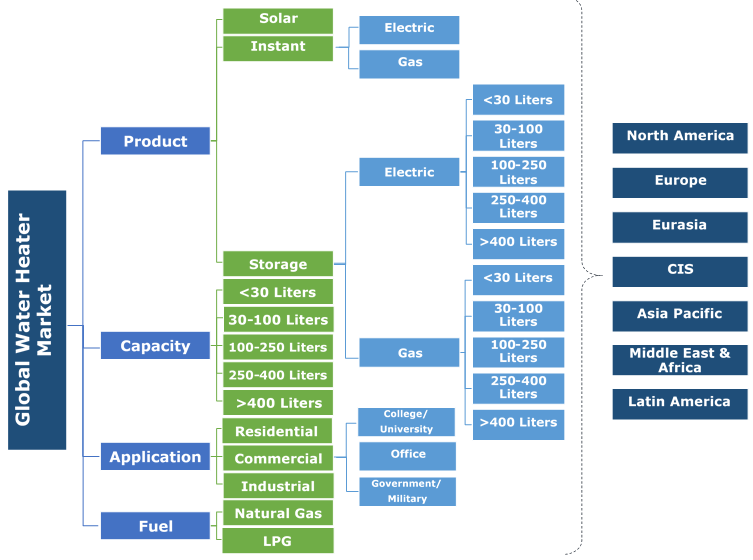 For instance, according to National Development and Reform Commission (NDRC), China’s natural gas consumption increased up to 19% through the first 11 months of 2017.
Notable industry players include Sun Tank, Alternate Energy Technologies, A.O Smith, Viessmann, Rheem manufacturing, Bradford White, Wagner Solar, Linuo Ritter, Bosch, Racold, V Guard Industries, Rinnai, Himin Solar Energy and Chromagen. Key players are introducing innovations & advancements in the existing technology to substantially increase their product demand. Various mergers & collaborations between the industry giants are complementing the business growth with primary focus on increasing the market share & facilitating efficient water heating systems to their customers.